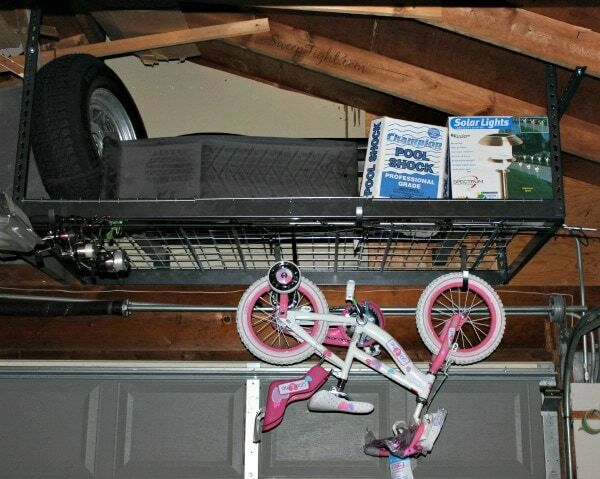 Garage storage can be a challenge, but SafeRacks helps you create more space. We were sent a SafeRacks unit for review purposes. All opinions are our own. When you lack garage storage because of space issues, your best bet is to get things off of the ground and utilize your overhead areas. SafeRacks allows you to do that safely and easily. Choosing the best SafeRacks unit was a little tricky for us. I left that part up to Mike and he was only nervous because of the strange setup that we have in our garage. Let’s just say, it’s built in a slightly “unique” way. We ended up getting the 6′ x 3′ unit and it worked out well. There are many sizes to choose from and they can work with each other if you get more than one. The unit arrived quickly and came with everything we needed to get started right away. Of course, I then had to wait for Mike to have the time and patience to install it. This wasn’t something I was going to take on myself, mostly because the garage is “his space”. After choosing the best location for us, installation wasn’t difficult at all. It was relatively easy for him to make the necessary modifications for it to fit in the space that he chose. I would say total installation time was under an hour. There is also an option to have them install it for you. The benefits of overhead storage are vast. Freeing up extra space can save money, increase your safety, and possibly help avoid arguments in your marriage. 😉 SafeRacks can hold up to 600 pounds, making them even more versatile with the storage possibilities. We haven’t completely decided on what to put on our SafeRacks yet. We chose some items just for the purpose of the picture. 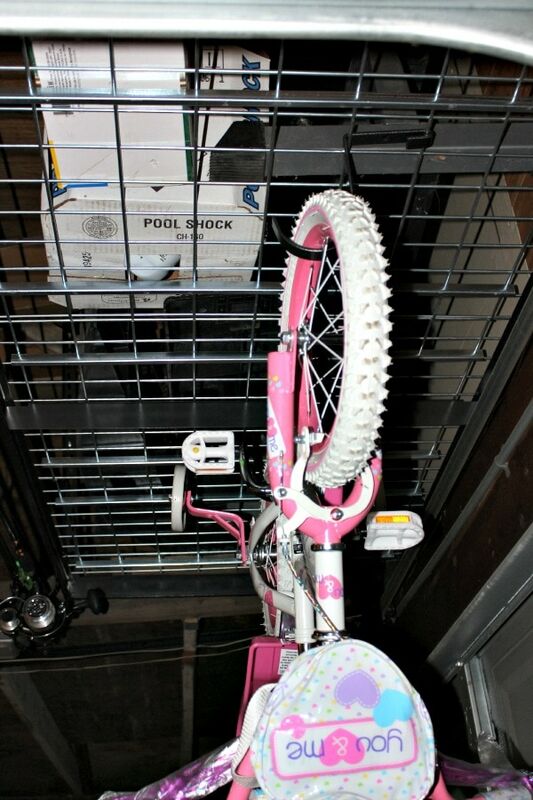 Notice how easy it is to hang bikes and fishing poles on the rack. Even heavy things like pool treatments and tires can now be kept up off of the ground. We are both definitely huge fans and appreciate the added garage storage space. Make this the year that you take back your garage with SafeRacks! Their helpful and friendly staff is waiting to help answer your questions and help you choose the best product for your needs. 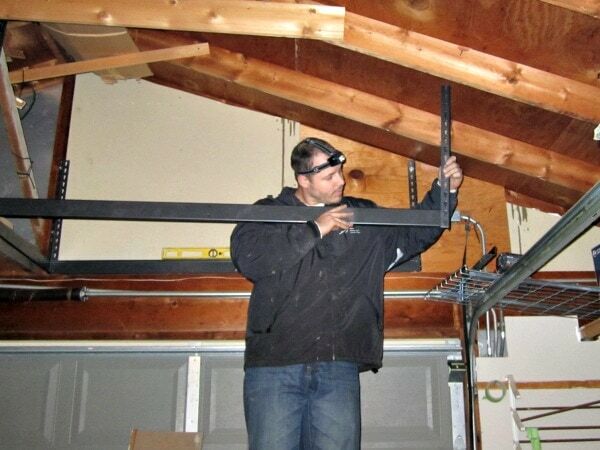 Could you benefit from additional overhead garage storage? How would you use SafeRacks? That definitely does look handy. Great way to get organized! I cannot tell you how packed our garage is! Unfortunately, it’s not at all organized, so some organization is desperately needed o.O We already have quite a bit hanging from our rafters but this might make it a little bit more organized! Our garage is super packed, too. But, we need to have space for parking the vehicles as it gets brutal cold during the long winters. I’ll need to consider this for better organization now that the spot my hubby used to hang his small boat is freed up. I have always wanted to add overhead garage storage!! Our garage is really really short, though, so we dont’ have a lot of room. I’m hoping I have more room in our next garage because I need more places to store seasonal decor. Oh that’s something my dad would get a lot of use of in his garage, he has things stored all over the place and it’s so easy to trip on stuff! Ooh, those look incredible!! I’d love to have these racks. i love this idea for all that extra storage space! i’m going to show my husband! i love how it holds up the bike! what a space saver! Ok, so we TOTALLY need one of these in our garage. It’s such a mess. I had wanted to start keeping one of our cars in there for the winter, but there is so much cram that we don’t have room. Ugh. It makes a big difference! And thank goodness we can fit our cars into the garage now with all the snow! I think overhead storage is such a great idea. Just make sure it’s installed properly so it doesn’t come tumbling down. Thank you for this review.